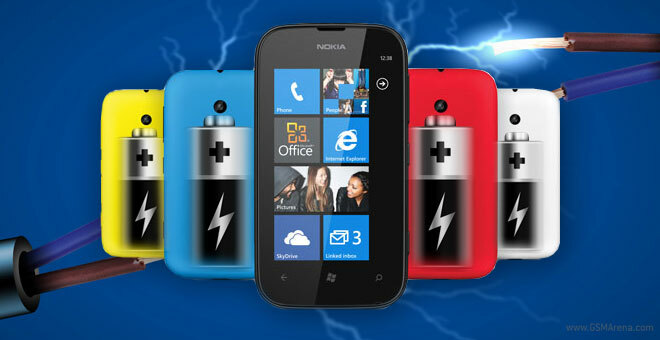 Now that our review of the Nokia Lumia 510 is over, we are ready to share the details on the smartphone’s battery test. It’s the first smartphone to run on Windows Phone 7.8 and is probably the one with least powerful hardware, so we were interested how it would do. The Lumia 510 shares many specs with the Lumia 610 we met with last summer, but comes with a 0.3-inch bigger display (that’s a more space to light up) and 4GB less of storage. In the first test, the Nokia Lumia 510 lasted 8 hours and 22 minutes of 3G calls, where the screen is off, of course. This is half an hour less than the Lumia 610, but still a good enough score. The web browsing test though is where the major difference comes – the Lumia 510 managed to last 6 hours and 13 minutes. This is almost two hours less than the Lumia 610. It’s true that the Lumia 510 has a bigger screen though but it seems the modifications to the Internet Explorer have had a negative impact on its endurance. Video playback time of the Nokia Lumia 510 came at 6 hours and 26 minutes. Once again, its achievement was an hour shorter than what the Lumia 610 – a difference too great to attribute to the different screen size alone. 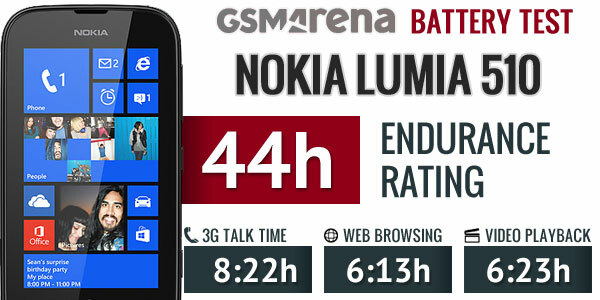 At the end though, the WP 7.8 platform more than made up for it, showing superior standby efficiency and helping the Lumia 510 score an endurance rating of 44 hours – that’s 1 hour more than the 610. The Lumia 510 simply did noticeably better than its Lumia 610 sibling when left idle, which helped it to a better overall score despite losing in all three individual challenges. So, the Lumia 510 will last you almost two days if you use it for 1 hour of video playback, web browsing and 3G talk each day. Its endurance will decrease quite rapidly if you are more of a heavy user though, as shown from the tests above.